Direct from the hit Hollywood Film "The Commitments", the man who has fronted the touring band for the last ten years, we are proud to present DAVE FINNEGAN'S COMMITMENTS. Dave Finnegan has performed along side such legendary artists as James Brown, Wilson Picket, Edwin Starr, Steve The Colonel? Cropper, Dennis Edwards (The Temptations), BB King, Sam Moore, Dan Ackroyd, Alexander O Neal and many, many more. It was Sam Moore who questioned, "how can a little white guy have a soul and a voice that's so black?". 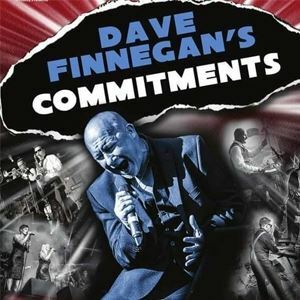 DAVE FINNEGAN'S COMMITMENTS feature the same commitment to their music, with the instantly recognisable horn section, and that sweet soul rhythm section. On their ongoing journeys they undoubtedly continue where the film left off, still spreading the word of Otis Redding, Wilson Picket and the other apostles of soul, and in doing so enabling us all to experience the essence of SWEET SOUL MUSIC. Now with his NEW SENSATIONAL SHOW & his own 8 PIECE BAND behind him performing all the hits from the film & much, much, more!